Thanks for stopping by. I've been polishing rocks and collecting minerals since I was a kid. I'm hoping I can share some tips with you and maybe learn a new trick or two myself along the way. Rock tumbling is a project of patience. The more meticulous you are in the steps, the better the finished product. 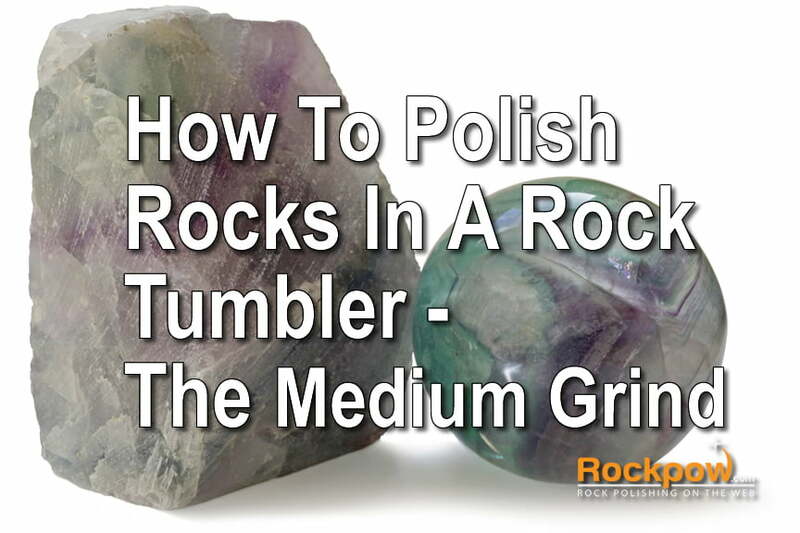 In this article we'll go over the medium grind and discuss the steps needed to get your stones on their way to being finely polished gems. Skip or rush this step and the final product is sure to suffer. After the first grind, or rough grind, the stones will take on a hazy appearance when dried off. All sharp areas should be gone and you should have already done a good inspection both wet and dry to make sure there are no cracked or unevenly ground stones in your batch. Any rocks with issues should be removed from the batch so as not to contaminate the medium grind. Since you are inspecting and removing stones that are not up to par, you may find that you don't have enough rocks to fill your tumbler to the best level for optimum performance and tumbling action. In this scenario, you'll need to use fillers. Plastic filler pellets make great filler and can be added to bring your batch up to the proper fill level. In addition, you'll be adding a cup of your medium abrasive grit. This is usually around 320 to 400 grit abrasive. Much finer than the rough grind, but not a polishing or fine grind abrasive by any means. Once you have your stones and filler in the tumbler, again you'll add water to fill the tumbler up to the top of, but not covering the stones. Seal it all up and you're ready to tumble! The medium grind is usually run for around a week. Again, like the rough grind, you'll inspect after the 1st day to make sure everything is coming along and also to release gas. Don't forget to add a little baking soda to deal with gasses in the batch as well. If you have any issues with the abrasive slurry, for example if it is either too thick or thin, add water or abrasive to bring it up to snuff. Over time you will get a feel for the perfect thickness for your stone slurry and your particular rock tumbler and current media. In the beginning though, remember a good enough mix that gets completed is way better than a perfect mix that never gets started. Get that rock tumbler tumbling and learn as you go. After you gain some experience, you may want to do your rough grind in two tumblers. When doing this, you gain the advantage of being able to have enough stones to do a good medium grind without any filler after removing any stones with issues. Of course, this can also mean you are left with too many stones for a single tumbler in the medium grind. You can always set some stones aside and use them in the next set of medium grind you need at a future date. Be sure to store the stones in a container with a label stating exactly what they are ie. rough ground jasper for example. That way you know in the future that these are ready for a medium grind when you have room for them in a batch that is of a similar hardness. At the end of the week, stop the tumbler and remove the stones. Like with the rough grind, you will want to thoroughly wash and remove all abrasives from the stones. It can't be stated enough that this is only to be done over a container to catch the grit and abrasive slurry. Never do this over a sink as the slurry can greatly damage the plumbing. This warning cannot be repeated enough. You don’t want to get careless because the price you pay will be a hefty one. All stones need to be cleaned until no abrasive remains and then inspected for consistent grinding and cracks. You should have fewer issues in a medium grind but it is still a good idea to check and remove any cracked stones. You may find some chipped stones and these can be put into a new medium grind to resolve the issue. Large chips in stones will mean they will either have to be tossed out or put through a new rough grind. Inconsistent polishing from poor tumbling action will also necessitate the need for a whole new medium grind session. There is no way to partially polish a stone that has spots with the grind missing. If you used any filler material such as plastic buttons then now is the time to wash those as well. Thoroughly remove all abrasive, dry, and set aside for use in the future. These can be used again with no issues. Be sure to check the stones after they are dry as well. Sometimes, a wet stone can hide chips or especially cracks. Once you have all of your stones thoroughly cleaned and free of abrasive, you can get ready to move on to the final fine grind. You'll be much closer to the finishing line and the stones should be taking shape at this point. Stay tuned for the next installment where we will go over the fine grind!